Yesterday I reviewed the new Kindle Paperwhite 3, and I promised a shopping comparison between the Kobo Glo HD and the Paperwhite. Right now they are the closest competitors to each other since I don’t consider the Kobo Glo HD to be a true competitor to the Kindle Voyage because of all the extra Voyage features. If you’re thinking about a 300 ppi eReader, you’re probably wondering Glo HD or Paperwhite? I don’t think there is a one size fits all answer to that question. A lot depends on your preferences. What I’m going to do is present them, feature by feature, and give you information to make your own decision. I like them both, for different reasons, and it would be tough for me to choose. The Glo HD is smaller and lighter, measuring 6.2″ x 4.5″ x 0.4″ and 6.4 oz while the Paperwhite is 6.7″ x 4.6″ x 0.36″ and 7.2 oz (WiFi only–3G model is 7.6 oz). If you want the smaller, lighter device, the Glo HD is the obvious choice here. As I said in my Paperwhite 3 review, I was disappointed by its resolution. When I got my Glo HD, I was pleasantly surprised at the sharpness of the text. I don’t see it with the Paperwhite. Looking at covers on the Home screen, the Glo definitely looks better. Those tiny thumbnails are amazingly clear. While reading, I think part of the difference is font selection. The Glo HD has the Georgia font, which I think highlights the resolution better than any of the Kindle fonts. If you want the best screen resolution, I think you’ll want to lean toward the Glo HD. The Glo HD allows you to make finer gradations in font size, font weight, line spacing and margins. The Glo allows you to choose between full justification and ragged right. If that level of control is important to you, seriously consider the Glo HD. The typography on the Kindles has long been a weakness, and the new typography options help but don’t change things very much, especially since the new typography doesn’t apply to all books and not at all to sideloaded books. Damn, that Glo just keeps going and going. When I took it out of its box on a Thursday, I was too impatient to charge it, and since it was at about 70%, I didn’t bother. I did plug it into my computer a few times to sideload books, but that was it. A week later–the following Friday–and 15 hours of reading, according to the Glo stats, I was still at 44%. I finally charged it because I kind of felt like I should, not because I needed to. In comparison, my Paperwhite 3 arrived on Monday, with a very low charge out of the box. I fully charged it and have been using it as my main ereader all week. I charged it last night, when the battery indicator showed about a quarter charge. So more than a week on a less than full charge to less than a week on a full charge. Granted, my Paperwhite is a 3G model, but it hasn’t left the house much. I left both devices on WiFi the entire time. The battery life on the Glo impressed me, and it totally wins this comparison. By now you’re probably thinking, “Why the heck would I get anything but a Glo HD?” I’m about to give you that reason. Page turns on the Glo HD are glacially slow. I mean glacial. It takes almost twice as long to register a page turn on the Glo HD, and sometimes I advance two pages because I thought the first one hadn’t registered. I did get used to it (sort of), but it was so nice to go back to the Paperwhite. If you’ve only used Kindles, you really can’t comprehend the difference, but it is huge. Check out the video and see the difference for yourself. The Paperwhite also wins for left-handed reading. While the Glo can be set to turn pages with your left thumb, the tap zones are still too large. I page backwards far too often on the Glo, where I almost never do on the Paperwhite. I appreciate being able to switch off which thumb turns the page, and the Paperwhite wins. The Paperwhite allows me to forget I am reading and totally immerse myself in the story. I don’t get the same experience with the Glo HD. This is less of a device comparison than a shopping comparison, but when you purchase a reading device, you are, essentially, deciding at which store you will do most of your shopping. It’s something to consider. I detest the Kobo store, and I don’t buy books from them. It’s far too easy to accidentally delete a book from your account when all you were trying to do was delete it from a device. I hate their store experience so much that I would rather buy from Amazon, load the book into Calibre, convert to kePub and sideload to my Glo HD. Admittedly, I’m probably an extreme case. I had a miserable experience with ePub on my Glo HD. Most of the typography features I mentioned above only work on books in the kePub format, not plain ePub. So, unless you purchase from Kobo directly, you’re probably going to have to become good friends with Calibre. You won’t have that problem with Amazon and a Paperwhite. If you are already in the habit of downloading purchases into Calibre, it may not bother you, but if you appreciate a seamless shopping/buying/loading experience, you’re probably going to prefer Amazon and the Paperwhite. Using Send to Kindle, Amazon gives you the same syncing ability with sideloaded books as with books purchased directly from them, and, if you regularly read sideloaded books on multiple devices, again, you’ll likely prefer Amazon. One bit of “good” news. With the resumption of agency-like contracts with the big publishers, there is rarely a price difference between the two sites on those titles. Comparison shopping between sites looks like a dying activity. Here’s where I’m going to dump features like Goodreads integration (none at all on the Glo HD), Pocket integration (none at all on the Paperwhite) and reading stats and badges (none on the Paperwhite). Also, screen saver as cover of current book (Glo HD) vs. random and not very interesting pictures (Paperwhite). If any those features are important to you, you’ll want to consider which ones are on which device. I doubt any/many of them will be deal breakers one way or the other. I do love the reading stats (badges not as much) and the Pocket integration of the Glo HD. If you want the best battery life and the maximum ability to control how your books look on the screen and can live with slower page turns, you’ll probably prefer the Glo HD. It does have a lot of nice features, and I expect future software updates will address the slow page turns. If the Glo strengths are important to you, they will probably outweigh the hassle factor of shopping/buying/loading content. If you want a reading device where buying is a one-step process, or you sideload and read on multiple devices and you’re not as picky how the book looks on the page, you’ll probably prefer the Paperwhite 3. I haven’t decided yet which one will be my main reader. I like elements of both. Sheer laziness will probably make me lean toward using the Paperwhite more, but, as I’ve said before, I do love the Pocket integration on the Glo HD. I use Pocket a lot, and the Glo handles the content well. I don’t think either is a bad choice. Each has areas where they excel. I hope I’ve given you the information to make an informed choice based on your preferences. Now I’m curious. Which one are you leaning toward and why? 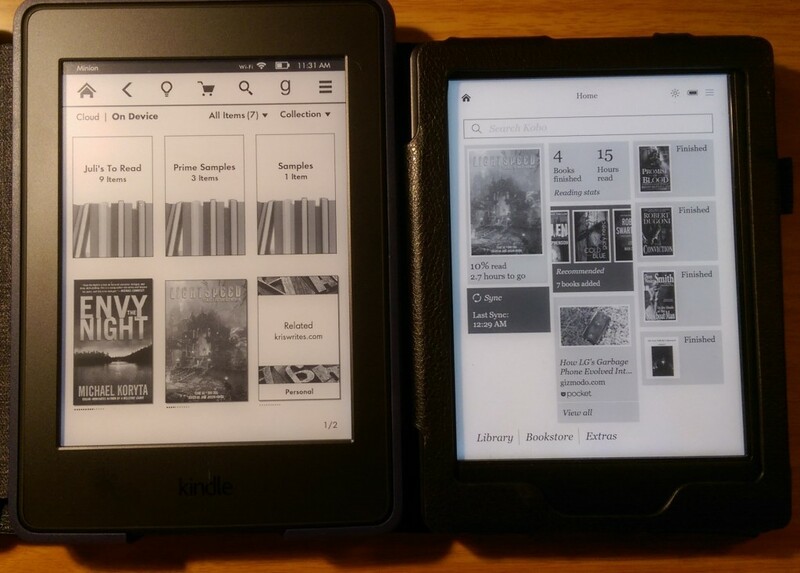 The post Head to Head: Kobo Glo HD vs Kindle Paperwhite 3 appeared first on TeleRead: News and views on e-books, libraries, publishing and related topics.